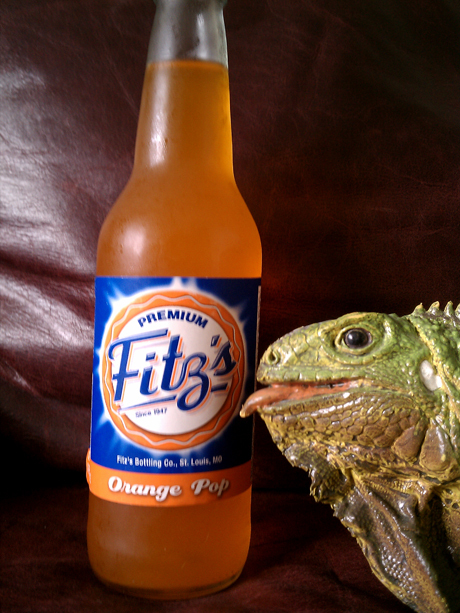 Dan “the Fan” W gave me this bottle of Fitz’s Orange Pop with the disclaimer that this was “the worst orange soda he’d ever had”. The ingredients indicate that it uses cane sugar, and filtered water… so maybe Dan is exaggerating a bit. On the other hand it also has your standard soda chemicals… so there is still promise of it being bad. Short intro. Let’s get going. I don’t know that I’ve ever had a drink SMELL so strongly of cardboard, but that’s exactly what this smells like. Like if a comical hobo (the kind you can feel ok about making fun of) found a piece of cardboard in the dumpster, but sitting on top of it was half an orange. “Cardboard ala Orange” he’d call it, and charge two comical fish heads per piece. Sadly it’s now time to drink. I wish it tasted more like cardboard, but this is like drinking Cardboard ala Orange out of a dirty sock. That’s not an exaggeration; it really does taste like it has been strained through a used athletic sock. The beginning is like you’re sucking on said sock, and that said sock has been saturated in orange soda. For the splitest of seconds you then get the solo taste of orange soda, only to be finished off by the rather disgusting flavor of the aforementioned Cardboard ala Orange combined with dirty sock. Dan was right; this is the worst orange soda I’ve ever had, hands down. I’m honestly having a tough time deciding on the verdict of this soda… so we’re going to see if I can finish it or not. I’ll tell you right now that I don’t want to, but I’m going to give it a shot. ***time lapse*** Still drinking… how does something sweetened with cane sugar taste so very awkward?! Ok, as unpleasant as the task was I did indeed finish it. Now for the parting shot. Twist has his "yuk" face on. Can't you tell?